First time I got a tiny bottle of Ylang ylang essential oil is when I studied for my Aromatherapy certification program. I heard of its aphrodisiac property and was dying to smell it! Intoxicating! That’s the first word that came into my mind when I opened the bottle. In my eagerness, I almost dipped my nose into the bottle! And I got a slight headache afterwards! Ylang ylang (Cananga odorata is its Latin name) comes from Annonaceae botanical family and Ylang ylang is the only species in this family. Monopoly! Ylang ylang is produced by steam distillation. The flowers may be distilled several times, thus Extra, complete,1st, 2nd and 3rd grades. ” Extra” is from the very first minutes of the distillation, and is considered the finest. “Complete” is all grades combined. Therefore, it is very important to know your supplier source and ask questions. The alcohol and ester content provide calming effect on the CNS (central nervous system). It relaxes and encourages one to experience pleasure and joy, hence, aphrodisiac! 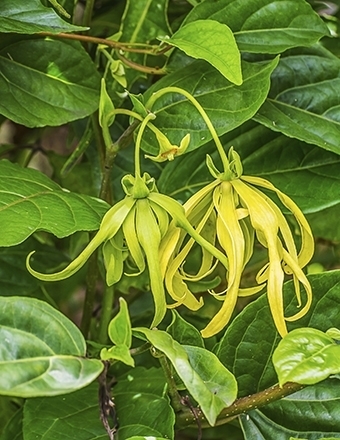 Ylang ylang lowers blood pressure and slows a rapid heart beat. Here is a recipe for rapid heart beat. Blend the above into 1 oz carrier oil or lotion you like. Apply to chest and heart when you experience symptoms. Besides its special place in the heart, Ylang ylang is excellent in skin care blends. It supports the skin to heal and is a super moisturizing agent. Ylang ylang is a gorgeous oil, floral and sweet. And a couple of drops goes a long way. Using too much will result in headaches and nausea. Some people can be sensitive despite of its attractive qualities. Robert Tisserand recommends maximum topical use of 0.8%. Always do a skin test. I came up with a wonderful face oil serum with Ylang ylang and other skin beneficial essential oils. In this blend, I use organic Ylang ylang Extra. 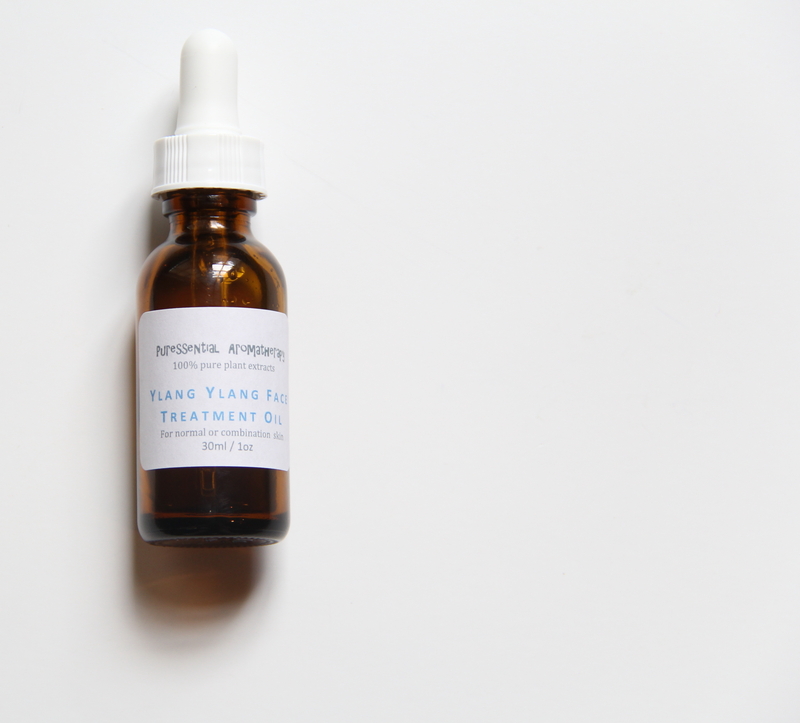 Why does skin need face treatment oil during warm weather? With the summer searing heat and damaging UV rays, our skin needs some external help in repairing and regeneration at night while we sleep! 100% pure essential oils (organic Ylang Ylang extra, French Lavender & Geranium) diluted in skin nourishing Sweet Almond oil, Argan Oil, Organic Sea Buckthorn CO2, Carrot Seed and Vitamin E.
+ Sweet Almond oil is rich in omega-9 and omega-6 fatty acids and is excellent for normal skin. It is supper light and absorbs into skin quickly leaving no residue. + Argan oil is rich in vitamin E and various essential fatty acids. It has amazing skin healing properties. + Organic Sea Buckthorn CO2 contains high amounts of carrotenoids, including pro-vitamin A and vitamin E and C. It offers excellent protection from UV rays. + Carrot Seed is high in carotol content and has wonderful skin-rejuvenative properties. + organic Ylang Ylang Extra is a wonderful moisturizing agent. Not to mention the gorgeous floral aroma! Ylang Ylang is calming to the nerve and has a special place in the heart. + Lavender is skin healing and helpful for skin irritations. + Geranium is cicatrisant and sebum balancing and supports skin healing. + Aroma is light floral. For normal or combination skin. For use at night time or when your skin needs extra nourishment. Hope you are now in love with Ylang ylang! Reblogged this on Winding River Essentials.